Flipping through pictures on my iPhone, I found a few interesting ones taken in August 2015. 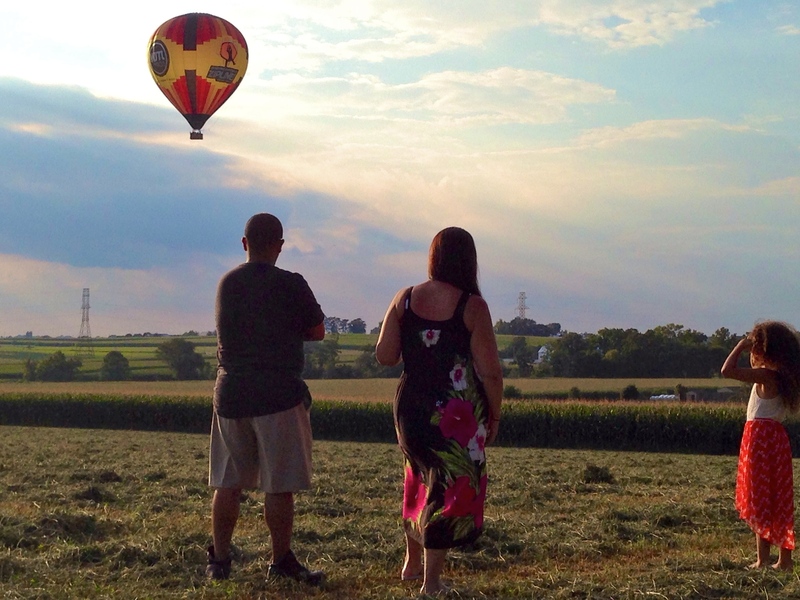 They were from an unexpected encounter with hot air balloons while I was visiting Lancaster, Pennsylvania. 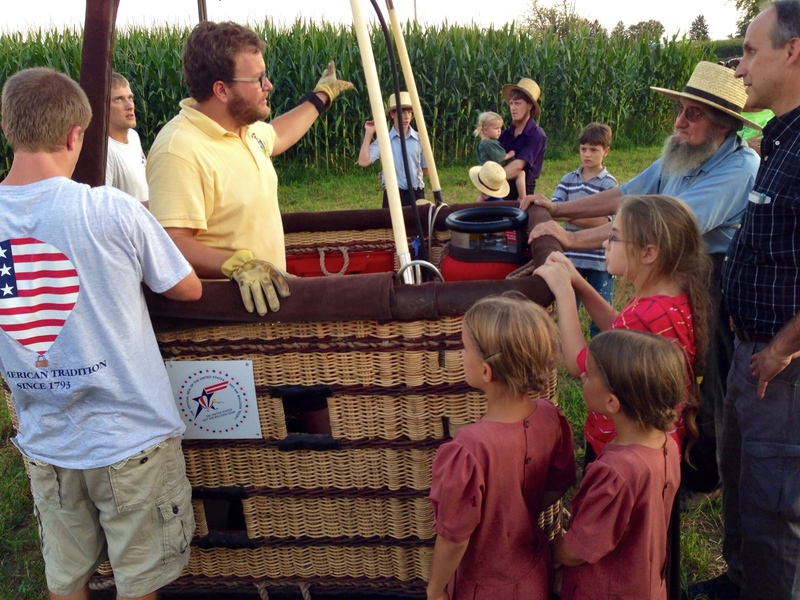 It turned out that they were from a balloon ride tour agency with a misleadingly official name, The United States Hot Air Balloon Team. Nonetheless, I found the ground crew to be professional, and the pilot to be knowledgeable and helpful. I uploaded some of these pictures to Wikimedia, as I often do with useful pictures taken in my free time. 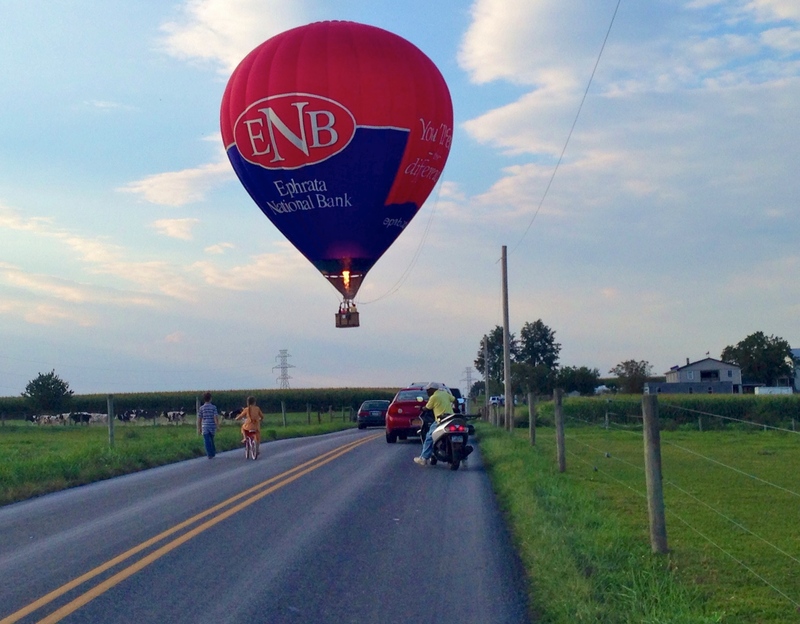 So we were driving through the town of Bird-in-Hand in Lancaster County, when we ran into this balloon drifting past the main road. That was quite a sight. I’d never seen hot air balloons this close to man-made structures. 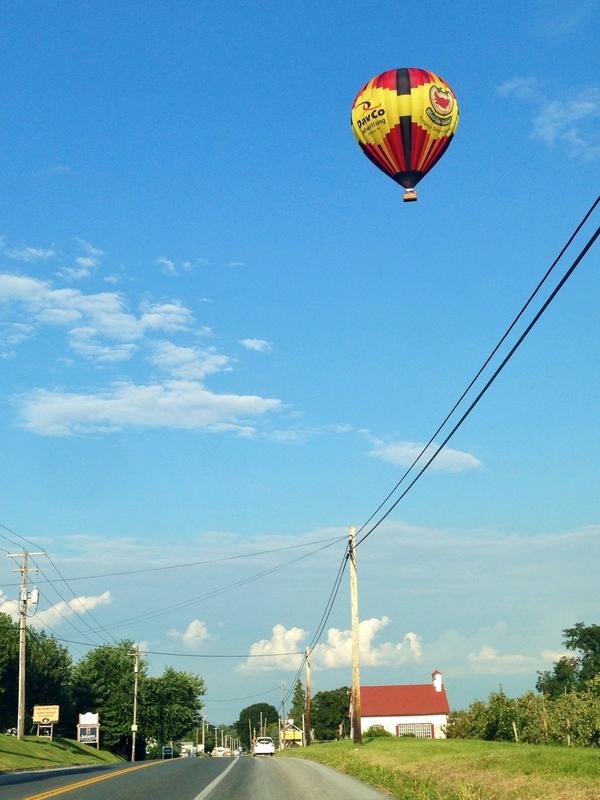 Well, I’d never seen hot air balloons this close with my own naked eyes, period. A balloon chase ensued. But unfortunately I don’t have chase pictures, because I was busy driving. And the head of my household was occupied marveling at the sight herself. So she wasn’t taking pictures either. We followed the balloon to the best we could, by predicting where it was going, and by finding routes on the navigation system to get us where we thought it would land. This chase lasted a long while. 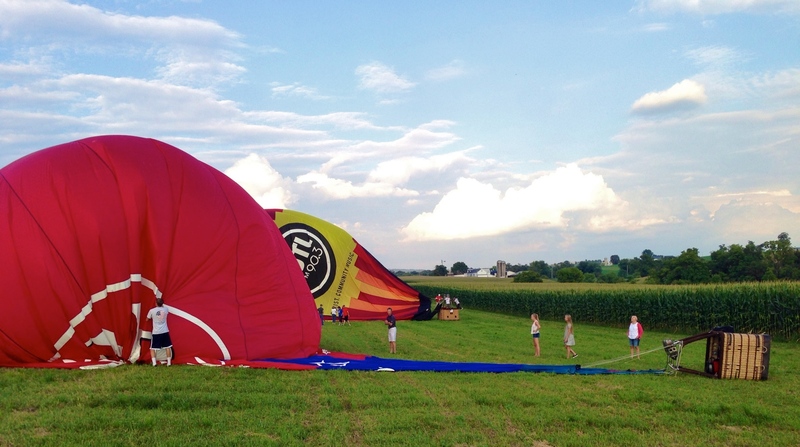 Just when we thought the balloon was about to land, it changed its mind and took off in search of a better landing site. Along the way we noticed two U-Haul-type trucks stalking us. I would lose them, only to see them show up 5 minutes later, via a different route, at where I thought the balloon was landing. 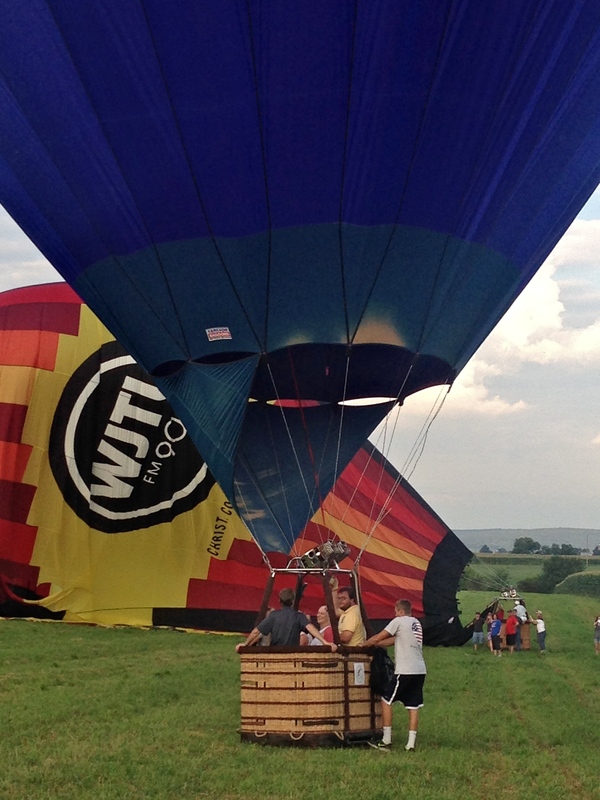 These trucks turned out to be from The United States Hot Air Balloon Team – they were the ground crew. So I learned that there were actually two balloons. And the ground crew was only slightly more clueful than I was about where the pilots were going to land. Apparently the pilots were at the mercy of the wind and thermals. Following was one such false landing. We all thought the pilot was going to land. I got out of the car and ran towards the field. There were other people watching the spectacle as well. But, no. It took off again. So I ran to my car, and continued the chase alongside the ground crew. 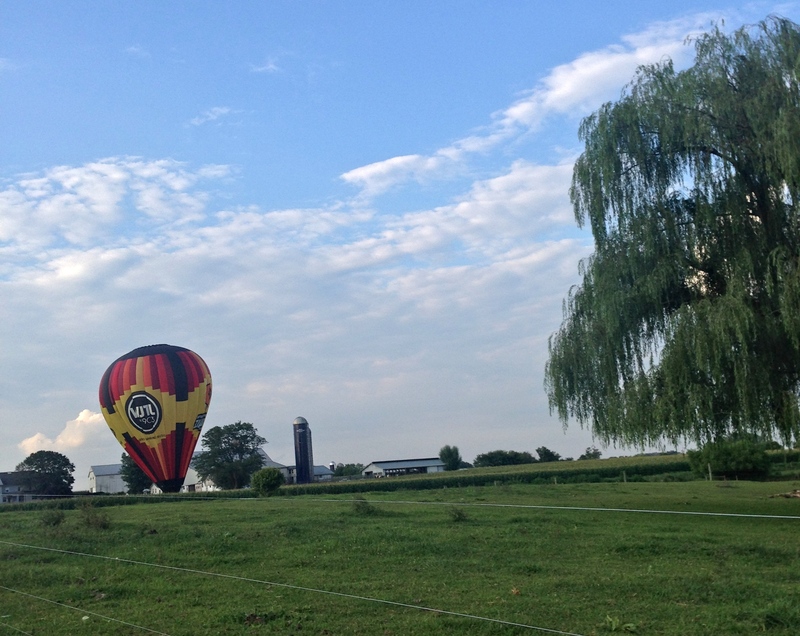 By the time I got to the next candidate landing site, the balloon was already quite close to the ground. The road was deadlocked, as cars, bikes and horse riders alike stopped in awe. 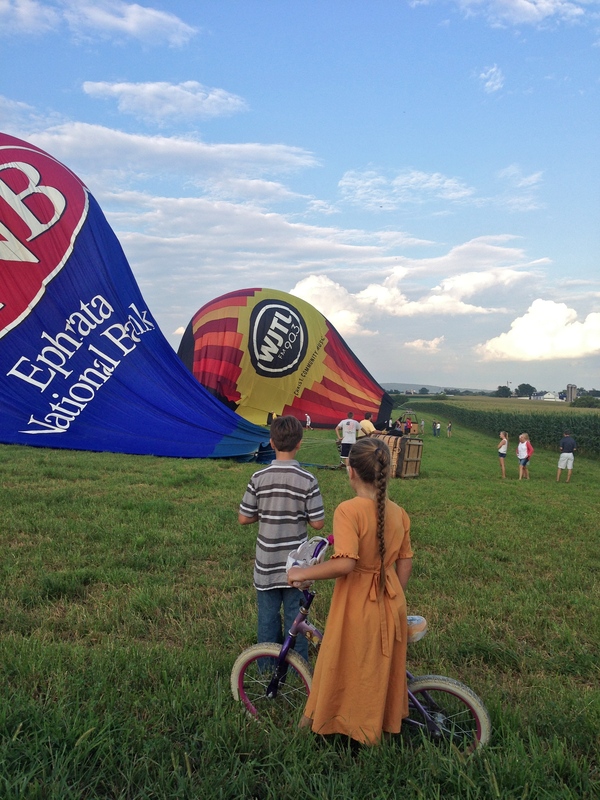 We abandoned our car in the middle of the road like everyone else, and ran towards the farm where the balloon landed. The head of my household took this picture as we ran. Caught up in the excitement of the moment, very few people noticed a second balloon following in the wake of the first one, until it seemingly materialized out of the thin air. It tracked almost the same path across the road. 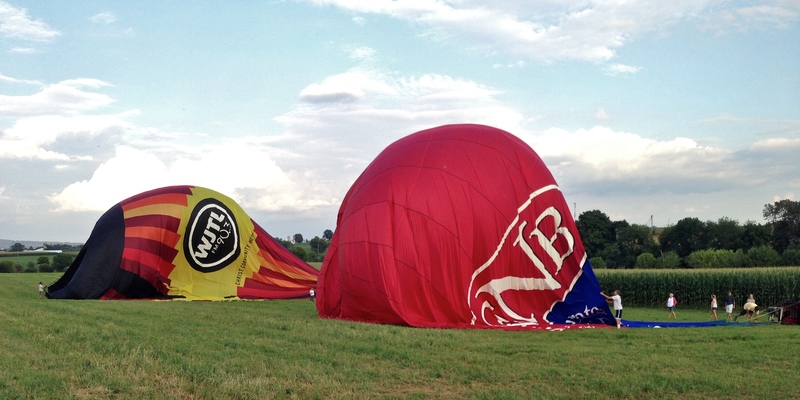 Incredibly, the second balloon landed precisely next to the first. The ground crew raced to the scene and held the balloons down with their youthful superpower. 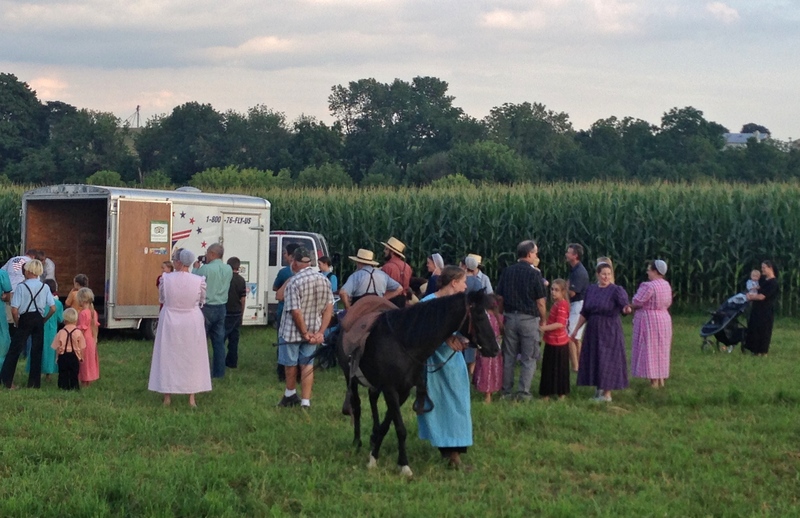 Just about everyone in the neighborhood came out to watch this event unfold. 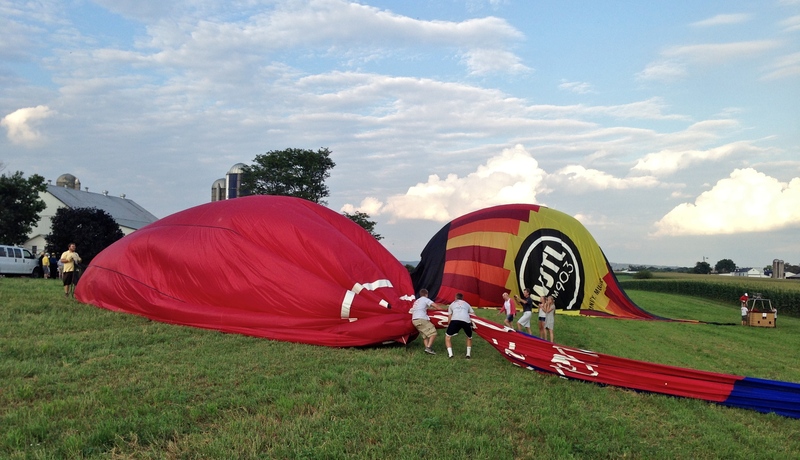 The crew started to deflate the balloons. 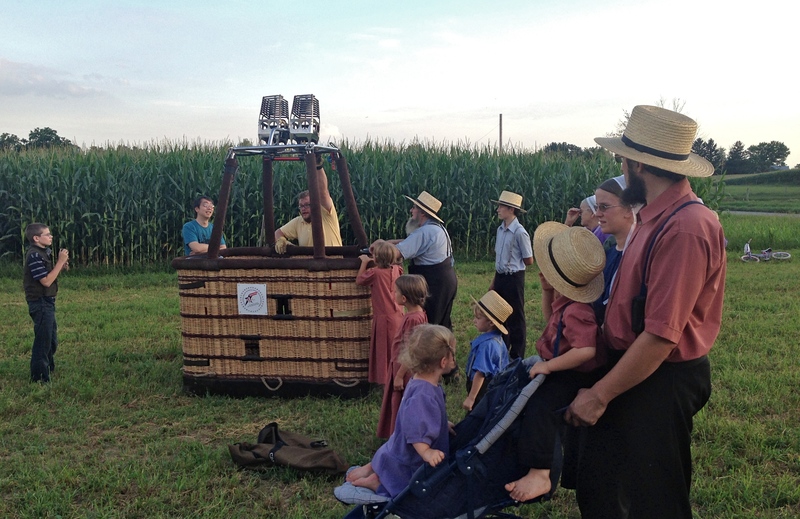 The pilot was happy to explain how they chose this site, and to answer any questions thrown his way by enthusiastic tourists and Amish neighbors. I wasn’t kidding earlier, when I said horse riders stopped to watch. The truck in the background was one of the two that stalked me. 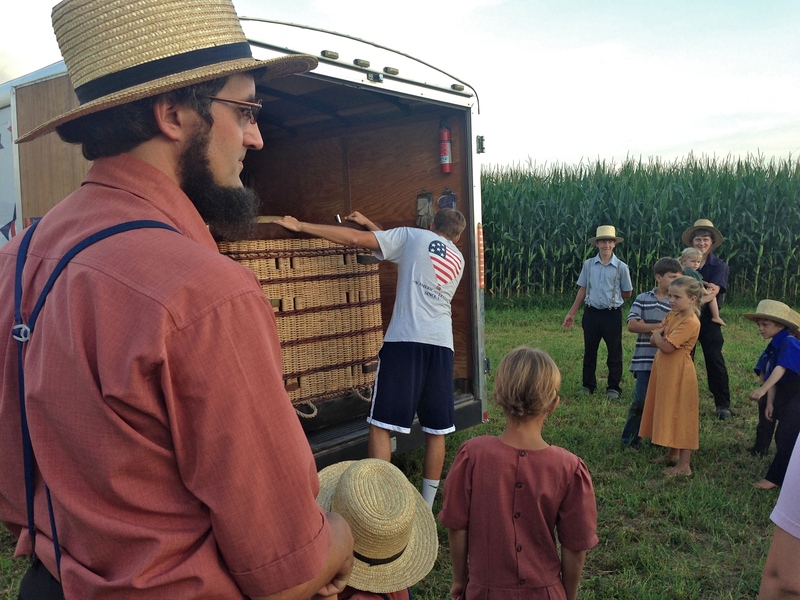 The wicker basket was safely hauled into the truck. The two trucks left. Everybody went back to their respective homes. We drove off. 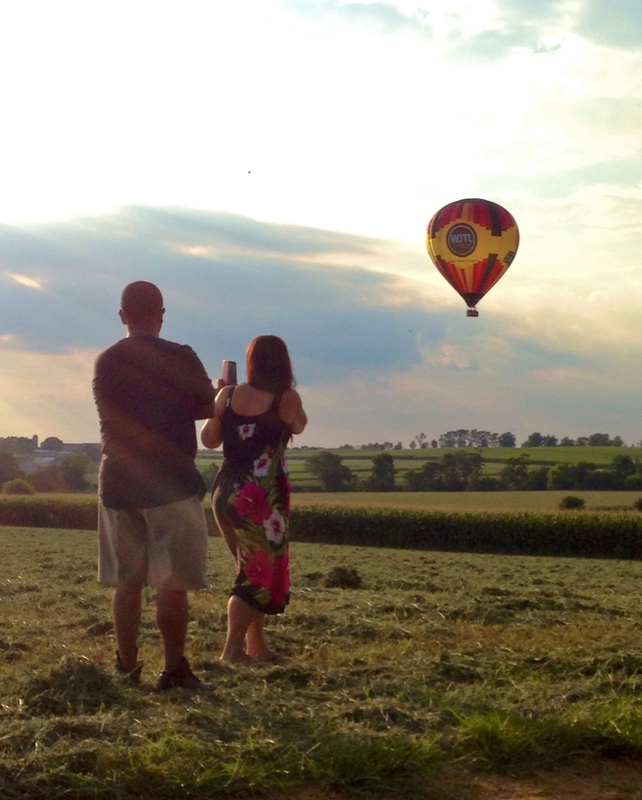 This entry was posted in Photography, RC Planes, Travel and tagged Bird-in-Hand, Hot Air Ballooon, Kodak Moment, Landing, Pennsylvania, Travel pictures. Bookmark the permalink.